Finals Week!! Don’t worry if you haven’t watched it yet, there will be no spoilers here regarding the winner! It was a good week though with lots of yummy bakes. For the signature round, the bakers had to make a meringue crown. If you’ve seen my previous posts you know that meringues aren’t my forte, so I’m going to pass on this for my final challenge. A classic Victoria Sponge was tricky technical. Finally the showstopper called for the bakers to make 49 (yes 49!) items for a regal picnic. This included mini quiches, scones, fruit tarts and a chocolate celebration cake. 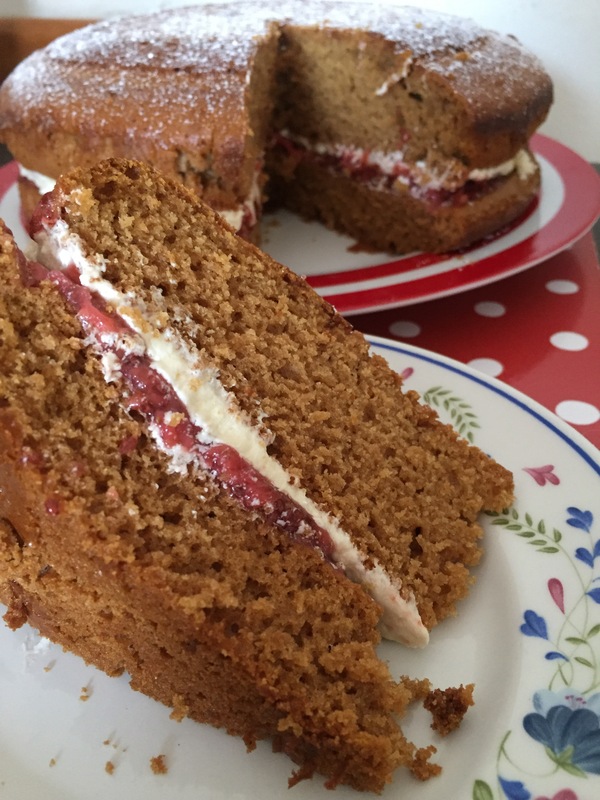 To be totally honest, I don’t have time to make 49 bakes this week plus I love a good Victoria Sponge, so the technical challenge is my bake for this week. 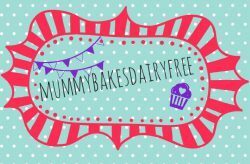 Of course it wouldn’t be a mummybakesdairyfree bake if it wasn’t allergy friendly and this one is vegan as well! The original recipe is from the Tesco Real Food website with a few substitutions. The original recipe called for caster sugar, which I subbed half of with coconut sugar. This gave the bake a darker appearance and a slightly caramel taste. Delicious but I’m not sure Mary Berry would have approved. For the filling I made my own strawberry chia jam. This time I subbed the honey for agave nectar making it vegan. I also adjusted the quantities of the buttercream from the original recipe to make it a thicker consistency. Having had more than a few slices, I don’t really think this can be classed as a traditional Victoria Sponge, however it is very tasty, little one loved it and you’d never guess it wasn’t full of dairy. A successful last bake in my mummybakesdairyfree does the Great British Bake Off. Stay tuned for my wrap up post of these series! 1. Preheat the oven to 180c. Grease and lightly flour the edges of two cake tins, lining the bottoms with baking paper. 2. Sift together the flour, sugars and bicarbonate of soda into a large bowl. 3. In a jug whisk together milk, oil, golden syrup and vanilla extract. Pour into the bowl of dry ingredients. 4. Use an electric hand mixer to whisk the ingredients together for two minutes until well combined, creamy and thick. 5. Divide the mixture evenly between the two cake tins and place in the oven to bake for 35 minutes. Remove from the oven and check the cakes are fully cooked by inserting a knife into the middles – if cooked, it should come out clean. Allow to cool for 15 minutes in the tins before removing and cooling fully on wire racks. 6. Whilst the cakes are cooling you can make he buttercream. In a large bowl add the dairy free spread and vanilla extract. Gradually sift in the icing sugar, mixing it together with an electric mixer as you do so. Once fully combined, light and fluffy, pop into the fridge to firm up for 30 minutes. 7. When the cakes have cooled and the icing has firmed up, take the cakes and place them face down on two plates. On the bottom half spread the jam over, covering evenly and to the edge. Do the same with the buttercream on the other half. Then carefully place the buttercream half, icing side down on top of the jam half. 8. Dust lightly with icing sugar and enjoy!! Dairy, egg, nut and soya free. Vegan.